DH Sewing Machine has been delivering results since we 1982. Our goal is to provide both a superior customer experience and tremendous value for our customers. DH Sewing Machine has over 60 years of experience in Industrial Sewing Machine and is passionate about exceeding your expectations. This business has been built on good family values and we are committed in keeping the success of the business for the future. Hoping that the next generation will join the business after they complete their education. When you boil it all down, the biggest difference of all between DH Sewing Machine and all the other sewing machine companies is ongoing, two-way communication. We make sure you’re fully informed before, during and after every service call and system installation. It’s all about peace of mind. And to us, none is more important than yours. The following are some of the products and services that we are servicing or suppling Parts; Adler, Baby Lock, Bernina, Brothers Embroidery, Consew Industrial Sewing, Machine, Consew Overlock Sewing Machines, Chandler, Cover Stitch, Cutting Machines, Cutting Tables, Domestic Home, Sewing Machines, Eastman Cutting Machines, Fusion Sewing Machine, Meistergram Embroidery, Groz Beckert Needle, Kansai Special, Merrow, New Long Bag Closer, Over-lock, Pfaff Walking Foot, Pegasus, Juki, Singer Sewing Machines, Silver Star Iron and other hand held Steam Irons, Scissors, Union Special, Viking Sewing Machine, Yamata, Yamato, Zoje. Walking foot machines for upholstery, standard walking foot machines for upholstery to specialty 4 needle lockstitch machines for parachutes, from long-arm zig-zag (up to 30”) machines for boat sails to extra heavy duty machines for webbing. We also provide bags, caps, shoes, wig sewing machines with rolling presser foot and attachment. Danny Hernandez and his wife run a great sewing machine sales and repair shop. I have had him repair my industrial and domestic over-lock and straight stich machines over the years. 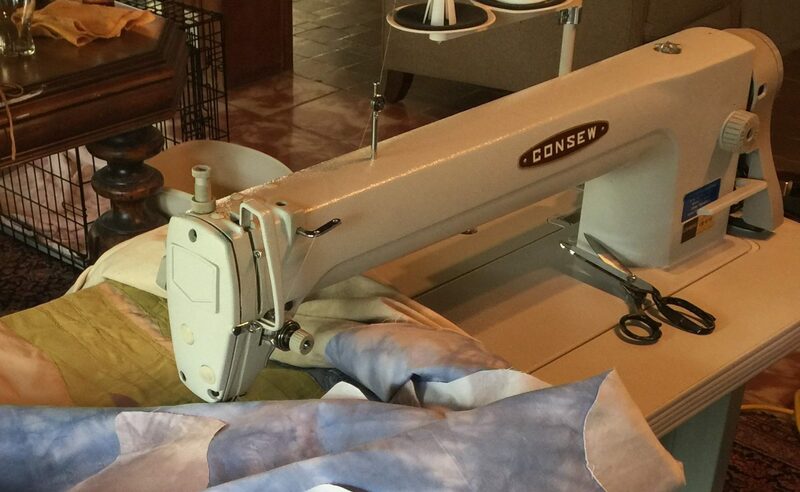 Now that I just opened up my tailoring shop, Sew On Set Tailor in the Design District, he was the only shop I trust to purchase a new machine from.He set me up with a great Juki that is perfect for a variety of alterations. He delivered it, set it up, corrected the tension and guaranteed his work. He is an honest business man with quality machines and service. I highly recommend him. I have a small one lady sweat shop Miss Brache’s I have been operating for about 7 years. I have been procrastinating and serging on a wonderful but not powerful enough home Juki machine. After about 3000 dresses the machine’s shank cracked. I expected this to happen eventually but still was ill prepared. I then in a rush to finish my work went to D H Sewing where I was treated wonderfully. The owner listened to my needs and price range. He was easy to speak to and very knowledgeable. I left with a wonderful Yamato 4 thread serger that sews beautifully. Later when I came to pick the machine up he had installed a new drawer and filled it with needles, screw driver, allen key and even some thread clips. Very thoughtful! I first used DH Sewing Machine based upon a recommendation. I was looking for a company to rebuild my Pfaff 545. They commended to replace the needle bar and complete hook. I notice an improvement upon sewing the heavy canvas we sew to cover boats. We are happy to have our 45 year old machine sewing like new. DH Sewing is an Excellent Company for any needs from Sales of Almost Any Sewing Machine, Repairs In Shop or out, to Trouble shooting any situation to your Machine. DH Sewing is a Legitimate company with Experience for over 40 years, Family owned with High Customer Satisfaction Success Base. Customer Service is Key to our Success. I Honestly recommend DH Sewing for their Honesty and Integrity . I respect and Honor Them how they have treated and done Business with me . And while at their Shop ( DH Sewing ) I’m Amazed how the Customer handling is done with Patience and you can see they care Thanks for the Servicing. Good Morning sir loving this new sewing machine I really appreciate you holding it for me boss I always wanted a 1245 Pfaff thanks DH sewing machines for making my Christmas. I can’t say enough good things about this place. We discovered DH sewing by driving by, we walked in and fell in love. Me and my boyfriend moved from Atlanta with a clothing line and a dream to manufacture all our clothes in the US. We walked in and the place is full of machines! Any machine you want they have. The owners Danny and Rafaela are so pleasant and knowledgeable. I can’t belive how much they know about machines. We learned so much from them and feel confident in our purchase. We bought a Straight Stitch sewing machine and a Surger. They run perfectly! Business is boomin and its all because of these two beautiful people. We recommend this company to everybody! They can fix any machine and the prices are unbelievable. They truly have the best customer service and turn around time. THANK YOU Danny and Rafaela! We are coming for the embroidery machine next !! Good Afternoon Danny, I am sending you this e-mail to express my heartfelt thanks. Its amazing how beautifully you restored my father’s Vintage Singer Sewing Machine. As you know my dear father passed away on Dec.14, 2017. He was a European Custom Tailor and Fitter. He was an apprentice at 12 years of age for a famous tailor in Budapest. His dream was to make men’s suits to order for movie stars. A few years later, the war started and my father and his family were taken to concentration camps. His suffering was unbearable, but he always had hope that he would survive and somehow come to America. After three miserable years and losing 39 members of his immediate family, miraculously he was liberated by the American Army. After living in Paris for a few years, he finally was able to come to America and arrived at Ellis Island in 1950. The very next day, with only speaking a few words of English, he traveled by New York City bus and trains to find a job. He found a job in a factory at the garment center. He purchased this factory Singer machine, which was already about forty years old. Since 1950 this was his machine and he created very special couture designs for his clientele in New York City. As soon as my father was eligible to become an American Citizen, he jumped at the first chance to take the test. In those days citizenship tests were given in English only. He passed the test on his first attempt. Long story short my father and mother were married in 1951. My parents met by introduction. My mother’s father and my father’s uncle were great friends. My father’s uncle had the opportunity to come to America, before the war started. In 1959 my father had a concession in a custom boutique. Slowly but surely he built a huge following. In the early 1960’s my father was creating suits to order for Frank Sinatra, Tony Bennett, Burt Parks, Joey Bishop, Peter Lawford and evening gowns for Ava Gardner. There were many other celebrities and diplomats that visited my Dad when they were in New York. This sewing machine was always by his side. When we relocated to Florida 25 years ago he took his machine to our new house. My father must be smiling down from heaven, looking at his sewing machine that was restored by a true craftsman. Today when this machine was delivered to my house I was filled with tears from sadness of missing my dad and joy looking at his machine which he loved so much. I am forever grateful to you for doing such a magnificent restoration. I will recommend you to anyone I know that needs specialty work. Forever Grateful For Your Expertise, Always Being Available & Being So Honest. We accept after hour appointments.